8x8 Switchboard Pro provides powerful searching ability to quickly locate contacts from your contact directory. Search All: Perform a keyword search across all fields and retrieve matching contacts. Filter by branch: Narrow your search to a branch by selecting from the drop-down of branches. Alphabetical Filter by Name: You can filter contacts by first or last name by clicking on the a letter in the alphabetical filter column. To refresh, click #. 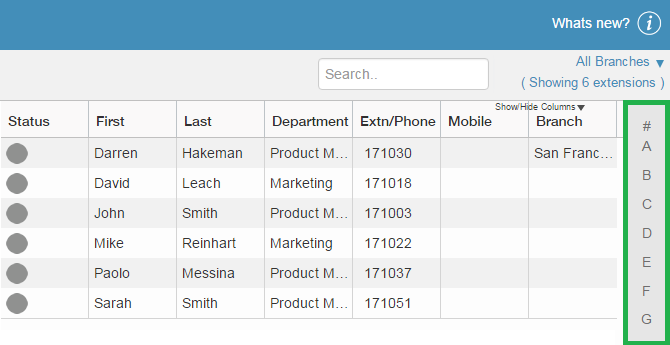 You can also sort field data alphanumerically in ascending or descending order by clicking on the desired field header.